This combines all my loves; blunt hair cut, short hemline with boots and lilac. By far my fave. I love short hemlines and statement shoes, this plus the addition of plaited, bleached hair and bold lips is so ideal - I want to be this girl! I love this look, the straight leg, semi cullotte style jeans (which are possibly from Topshop - I think I have tried them on) are so modern. I love how she has mixed a baggy(ish) outfit with sleek hair and shoes. I have seen so many fashion week attendees with similar oversized tote bags, I might have to purchase the one I saw in Primark the other day - they seem like the most practical accessory ever. Love love love all of this, the sheer, the white and the detailed accessories make for such a good combo. 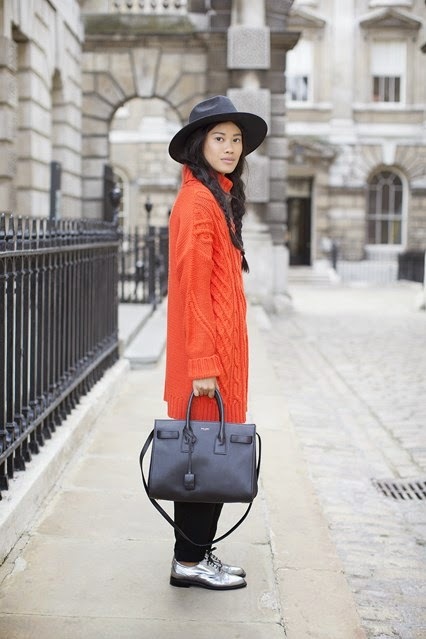 I love that this blogger has mixed silver brogues with a neon jumper, so eye-catching. This is here for the boots. I am obsessed with pointed boots and especially silver ones. Neon tailoring is so bold and eye-catching, it somehow combines serious and fun vibes in the most perfect way. Following New York Fashion Week, London has predictably gone the extra mile in the bold stakes. We are still seeing a lot of metalics and trainers but London has injected chunky shoes, oversized clothing and ripped denim into the mix, resulting in a charmingly unpolished edge. Number one is my favourite too, I love the boots!